The Korswagen group studies canonical and non-canonical Wnt signaling mechanisms using the model system Caenorhabditis elegans. Wnt signaling plays a central role in embryonic development, adult tissue homeostasis and cancer. At the cellular level, Wnt proteins can trigger a wide variety of responses, ranging from cell fate specification and proliferation to cell polarization and migration. We are interested in the mechanism of the canonical and non-canonical Wnt signaling pathways that mediate these different responses. As a model we use the nematode C. elegans, which offers a powerful genetic system to study evolutionarily conserved Wnt signaling mechanisms at single cell resolution. smFISH staining of prkl-1 mRNA in the QR neuroblast descendant QR.pa. 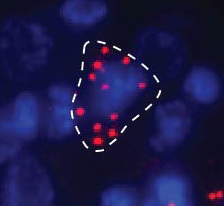 Each red dot represents a single prkl-1 mRNA molecule. Canonical Wnt/beta-catenin signaling controls the migration of the QL descendants by inducing expression of the target gene mab-5. In wild type animals, mab-5 shows very little variability in expression levels. To study how such low variability is achieved, we collaborated with the group of Alexander van Oudenaarden to combine smFISH with mutant analysis and mathematical modeling.1 Interestingly, we found that when certain Frizzled Wnt receptors are mutated, the variability in mab-5 expression is strongly increased. Further examination of various Wnt pathway mutants led to the discovery that there is extensive cross-talk within the Wnt pathway, with embedded interlocked positive and negative feedback loops that dampen the variability in target gene expression. These results highlight the influence of gene network architecture on expression variability and implicate feedback regulation as an effective mechanism to ensure developmental robustness. In a parallel line of research, we discovered that the HECT-domain containing ubiquitin ligase Huwe1 functions as an evolutionarily conserved negative regulator of Wnt/beta-catenin signaling.2 In collaboration with the group of Vita Bryja at Masaryk University in the Czech Republic, we found that Huwe1 binds to and ubiquitylates the cytoplasmic Wnt pathway component Dishevelled (Dvl). Importantly, instead of targeting Dvl for degradation, Huwe1 inhibits the multimerization of Dvl that is required for signaling activity. Previous studies have shown that the migration of the QR descendants is dependent on multiple Wnt ligands and receptors. We found that the migration of the QR descendants can be divided into three sequential phases that are each mediated by a distinct Wnt signaling mechanism.3 First, long-range anterior migration is mediated by parallel-acting MOM-5/Frizzled and CAM-1/Ror2 dependent non-canonical Wnt pathways. Second, once the QR descendants reach their final anterior position, migration is stopped by activation of canonical Wnt/beta-catenin signaling. Finally, the short-range dorsoventral migration that places the QR descendants at their ultimate positions is dependent on a planar cell polarity (PCP) related Wnt pathway. Interestingly, we found that Wnt ligands do not act instructively in this process. Instead, our results show that the QR descendants switch between these signaling pathways by temporally regulating the expression of a Frizzled Wnt receptor. Cell intrinsic timing of receptor expression is also an important guidance mechanism in mammalian nervous system development, but the mechanism of this temporal regulation is still unknown. We are currently investigating how temporal regulation of Wnt receptor expression is achieved and how Wnt pathway cross-talk controls QR descendant migration. Furthermore, we are interested in how signaling through CAM-1/Ror2 and MOM-5/Frizzled controls QR polarity and migration. 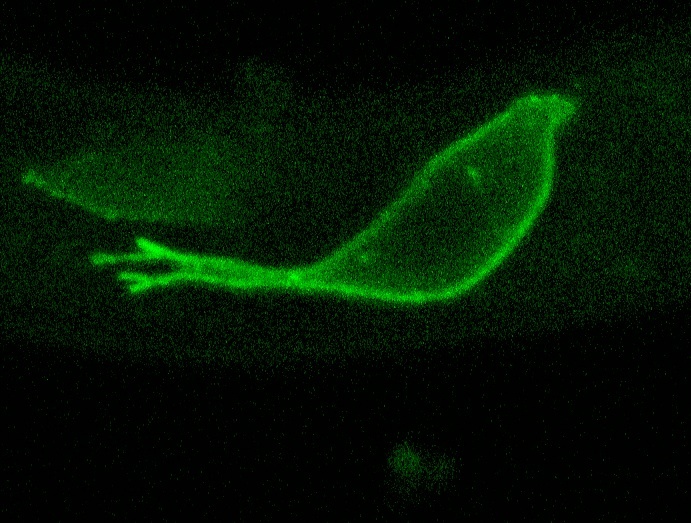 Using a combination of genetic studies in C. elegans and cell biological experiments in mammalian tissue-culture cells, we have discovered that Wnt proteins require a specialized secretion pathway to be released from Wnt producing cells. A central player in this secretion pathway is the Wnt binding protein Wntless (Wls), which binds Wnt in the endoplasmic reticulum (ER) and escorts it through the Golgi network to the plasma membrane for release. Further analysis of the retromer dependent endosome to TGN transport of Wls revealed that it is mediated by a novel retromer pathway.6,7 In this pathway, the cargo-selective subunits of the retromer interact with the sorting nexin family member SNX3 and sort Wls into vesicular transport carriers that are morphologically distinct from the tubular transport carriers that are formed by the classical retromer complex. Ji, N., Middelkoop, T.C., Mentink, R.A., Betist, M.C., Tonegawa, S., Mooijman, D., Korswagen, H.C.* and van Oudenaarden, A* (2013) Feedback control of gene expression in the Caenorhabditis elegans Wnt pathway. Cell, 155: 869-880. *Joint senior/corresponding authors. See also Cell Video abstract. de Groot, R.E., Ganji, R.S., Bernatik, O., Lloyd-Lewis, B., Seipel, K., Sedova, K., Zdrahal, Z., Dhople, V.M., Date, T., Korswagen, H.C.* and Bryja, V.* (2014) Huwe1-mediated ubiquitylation of Dvl defines a novel negative feedback loop in the Wnt signaling pathway. Science Signal 7: ra26. *Joint senior/corresponding authors. See also Science Signaling Podcast on our paper. Mentink, R.A., Middelkoop, T.C., Rella, L., Ji, N., van Oudenaarden, A., and Korswagen, H.C. (2014) Cell intrinsic modulation of Wnt signaling controls neuroblast migration in C. elegans. Yang, P.T., Lorenowicz, M., Silhankova, M., Coudreuse, D.Y.M., Betist, M.C. Korswagen, H.C. (2008) Wnt signaling requires retromer dependent recycling of MIG-14/Wls in Wnt producing cells. Coudreuse, D.Y.M., Roel, G., Betist, M.C., Destrée, O. and Korswagen, H.C. (2006) Wnt gradient formation requires retromer function in Wnt producing cells. Silhankova, M., Port, F., Harterink, M., Basler, K., Korswagen, H.C. (2010) Wnt signaling requires MTM-6 and MTM-9 myotubularin lipid-phosphatase function in Wnt producing cells. Harterink, M., Port, F., Lorenowicz, M., McGough, I., Silhankova, M., Betist, M., van Weering, J., van Heesbeen, R., Middelkoop, T., Basler, K., Cullen, P., Korswagen, H.C. (2011) A SNX3-dependent Retromer pathway mediates retrograde transport of the Wnt sorting receptor Wntless and is required for Wnt secretion. de Groot, R.E., Rappel, S.B., Lorenowicz, M.J. and Korswagen H.C. (2014) Protein kinase CK2 is required for Wntless internalization and Wnt secretion. Lorenowicz, M.J., Macurkova, M., Harterink, M., Middelkoop, T.C., de Groot, R., Betist, M.C. and Korswagen, H.C. (2013) Inhibition of late endosomal maturation restores Wnt secretion in Caenorhabditis elegans vps-29 retromer mutants.